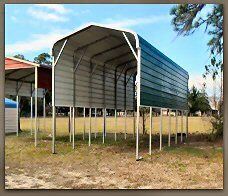 Boxed Eave Carports.The Box eave style carport is the “A” frame roof design, with an amazing structural outcome. Vertical Roof Style. A-Frame roof with the rooking panels installed vertically (the corrugated ridges run from the ridge cap down to the eave). 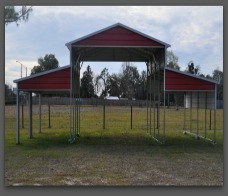 Regular Style Carport. 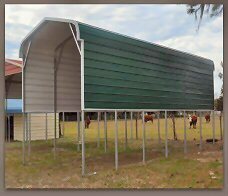 The Regular Style Carport is the rolled shoulder design, making it less expensive and more sturdy. DO YOU HAVE A CAR, BOAT OR RV THAT NEEDS SHELTERED FROM THE SUN OR RAIN? WE HAVE WHAT YOU NEED. 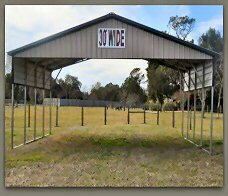 WITH SIZES FROM 12’ TO 40’ WIDE, ANY LENGTH &UP TO 20’ TALL, WE CAN COVER ALMOST ANYTHING. 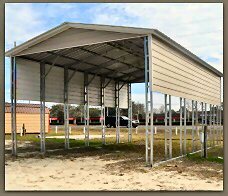 OUR CARPORTS ARE BUILT WITH 2.5'' GALVANIZED STEEL FRAMING &29 GAUGE METAL ROOF PANELS. ALL STYLES AND SIZES ARE AVAILABLE IN 17 DIFFERENT COLORS.